This week, Kohala, Hawaii hosts the 41st International Conference of Very Large Databases (VLDB 2015), a premier annual international forum for data management and database researchers, vendors, practitioners, application developers and users. As a leader in Database research, Google will have a strong presence at VLDB 2015 with many Googlers publishing work, organizing workshops and presenting demos. The research Google is presenting at VLDB involves the work of Structured Data teams who are building intelligent and efficient systems to discover, annotate and explore structured data from the Web, surfacing them creatively through Google products (such as structured snippets and table search), as well as engineering efforts that create scalable, reliable, fast and general-purpose infrastructure for large-scale data processing (such as F1, Mesa, and Google Cloud's BigQuery). If you are attending VLDB 2015, we hope you’ll stop by our booth and chat with our researchers about the projects and opportunities at Google that go into solving interesting problems for billions of people. You can also learn more about our research being presented at VLDB 2015 in the list below (Googlers highlighted in blue). Google is a Gold Sponsor of VLDB 2015. In 2009, Google created the PhD Fellowship program to recognize and support outstanding graduate students doing exceptional research in Computer Science and related disciplines. Now in its seventh year, our fellowship programs have collectively supported over 200 graduate students in Australia, China and East Asia, India, North America, Europe and the Middle East who seek to shape and influence the future of technology. Reflecting our continuing commitment to building mutually beneficial relationships with the academic community, we are excited to announce the 44 students from around the globe who are recipients of the award. We offer our sincere congratulations to Google’s 2015 Class of PhD Fellows! We have just completed another round of the Google Faculty Research Awards, our annual open call for research proposals on Computer Science and related topics, including systems, machine learning, software engineering, security and mobile. Our grants cover tuition for a graduate student and provide both faculty and students the opportunity to work directly with Google researchers and engineers. This round we received 805 proposals, about the same as last round, covering 48 countries on 6 continents. After expert reviews and committee discussions, we decided to fund 113 projects, with 27% of the funding awarded to universities outside the U.S. The subject areas that received the highest level of support were systems, machine perception, software engineering, and machine learning. The Faculty Research Awards program plays a critical role in building and maintaining strong collaborations with top research faculty globally. These relationships allow us to keep a pulse on what’s happening in academia in strategic areas, and they help to extend our research capabilities and programs. 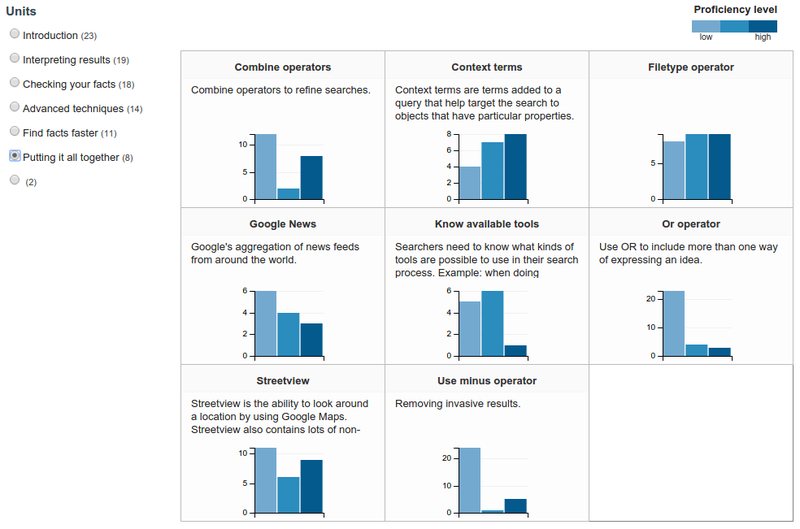 Faculty also report, through our annual survey, that they and their students benefit from a direct connection to Google as a source of ideas and perspective. When a small team of software engineers first started working on Flu Trends in 2008, we wanted to explore how real-world phenomena could be modeled using patterns in search queries. Since its launch, Google Flu Trends has provided useful insights and served as one of the early examples for “nowcasting” based on search trends, which is increasingly used in health, economics, and other fields. Over time, we’ve used search signals to create prediction models, updating and improving those models over time as we compared our prediction to real-world cases of flu. Instead of maintaining our own website going forward, we’re now going to empower institutions who specialize in infectious disease research to use the data to build their own models. Starting this season, we’ll provide Flu and Dengue signal data directly to partners including Columbia University’s Mailman School of Public Health (to update their dashboard), Boston Children’s Hospital/Harvard, and Centers for Disease Control and Prevention (CDC) Influenza Division. We will also continue to make historical Flu and Dengue estimate data available for anyone to see and analyze. Flu continues to affect millions of people every year, and while it’s still early days for nowcasting and similar tools for understanding the spread of diseases like flu and dengue fever—we’re excited to see what comes next. To download the historical data or learn more about becoming a research partner, please visit the Flu Trends web page. Pursuing Google’s mission of organizing the world’s information to make it universally accessible and useful takes an enormous amount of computing and storage. In fact, it requires coordination across a warehouse-scale computer. Ten years ago, we realized that we could not purchase, at any price, a datacenter network that could meet the combination of our scale and speed requirements. So, we set out to build our own datacenter network hardware and software infrastructure. Today, at the ACM SIGCOMM conference, we are presenting a paper with the technical details on five generations of our in-house data center network architecture. This paper presents the technical details behind a talk we presented at Open Network Summit a few months ago. From relatively humble beginnings, and after a misstep or two, we’ve built and deployed five generations of datacenter network infrastructure. Our latest-generation Jupiter network has improved capacity by more than 100x relative to our first generation network, delivering more than 1 petabit/sec of total bisection bandwidth. This means that each of 100,000 servers can communicate with one another in an arbitrary pattern at 10Gb/s. Such network performance has been tremendously empowering for Google services. Engineers were liberated from optimizing their code for various levels of bandwidth hierarchy. For example, initially there were painful tradeoffs with careful data locality and placement of servers connected to the same top of rack switch versus correlated failures caused by a single switch failure. 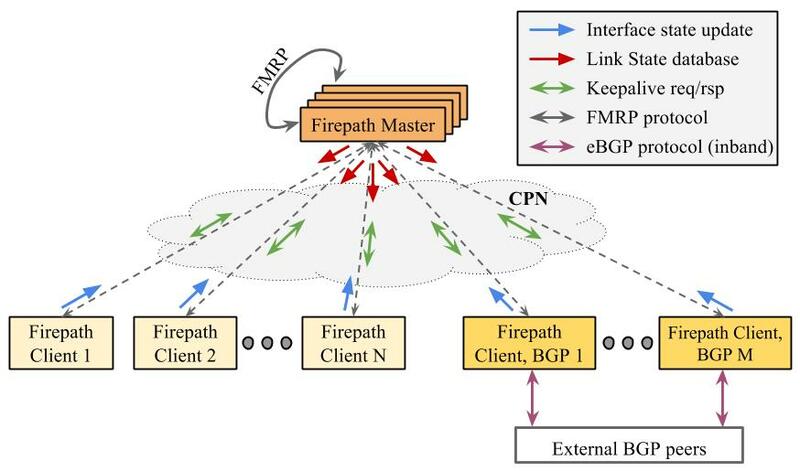 A high performance network supporting tens of thousands of servers with flat bandwidth also enabled individual applications to scale far beyond what was otherwise possible and enabled tight coupling among multiple federated services. Finally, we were able to substantially improve the efficiency of our compute and storage infrastructure. As quantified in this recent paper, scheduling a set of jobs over a single larger domain supports much higher utilization than scheduling the same jobs over multiple smaller domains. Delivering such a network meant we had to solve some fundamental problems in networking. Ten years ago, networking was defined by the interaction of individual hardware elements, e.g., switches, speaking standardized protocols to dynamically learn what the network looks like. Based on this dynamically learned information, switches would set their forwarding behavior. 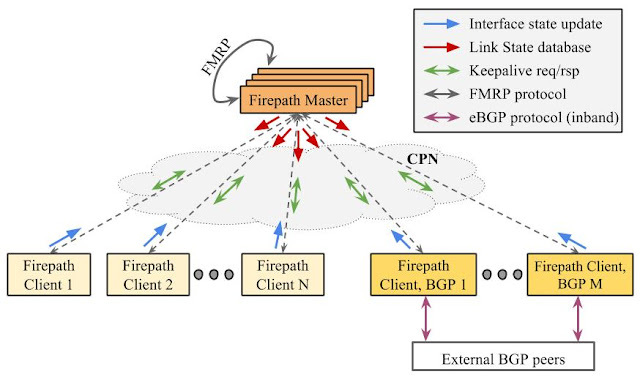 While robust, these protocols targeted deployment environments with perhaps tens of switches communicating between between multiple organizations. Configuring and managing switches in such an environment was manual and error prone. Changes in network state would spread slowly through the network using a high-overhead broadcast protocol. Most challenging of all, the system could not scale to meet our needs. We adopted a set of principles to organize our networks that is now the primary driver for networking research and industrial innovation, Software Defined Networking (SDN). We observed that we could arrange emerging merchant switch silicon around a Clos topology to scale to the bandwidth requirements of a data center building. The topology of all five generations of our data center networks follow the blueprint below. Unfortunately, this meant that we would potentially require 10,000+ individual switching elements. Even if we could overcome the scalability challenges of existing network protocols, managing and configuring such a vast number of switching elements would be impossible. So, our next observation was that we knew the exact configuration of the network we were trying to build. Every switch would play a well-defined role in a larger-ensemble. That is, from the perspective of a datacenter building, we wished to build a logical building-scale network. For network management, we built a single configuration for the entire network and pushed the single global configuration to all switches. Each switch would simply pull out its role in the larger whole. Finally, we transformed routing from a pair-wise, fully distributed (but somewhat slow and high overhead) scheme to a logically-centralized scheme under the control of a single dynamically-elected master as illustrated in the figure below from our paper. Our work on Bandwidth Enforcer shows how we can allocate wide area bandwidth among tens of thousands of individual applications based on centrally configured policy, substantially improving network utilization while simultaneously isolating services from one another. Condor addresses the challenges of designing data center network topologies. Network designers can specify constraints for data center networks; Condor efficiently generates candidate network designs that meet these constraints, and evaluates these candidates against a variety of target metrics. Congestion control in datacenter networks is challenging because of tiny buffers and very small round trip times. TIMELY shows how to manage datacenter bandwidth allocation while maintaining highly responsive and low latency network roundtrips in the data center. 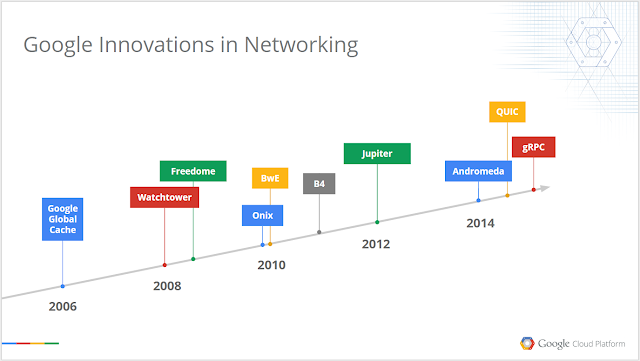 These efforts reflect the latest in a long series of substantial Google contributions in networking. We are excited about being increasingly open about results of our research work: to solicit feedback on our approach, to influence future research and development directions so that we can benefit from community-wide efforts to improve networking, and to attract the next-generation of great networking thinkers and builders to Google. Our focus on Google Cloud Platform further increases the importance of being open about our infrastructure. Since the same network powering Google infrastructure for a decade is also the underpinnings of our Cloud Platform, all developers can leverage the network to build highly robust, manageable, and globally scalable services. 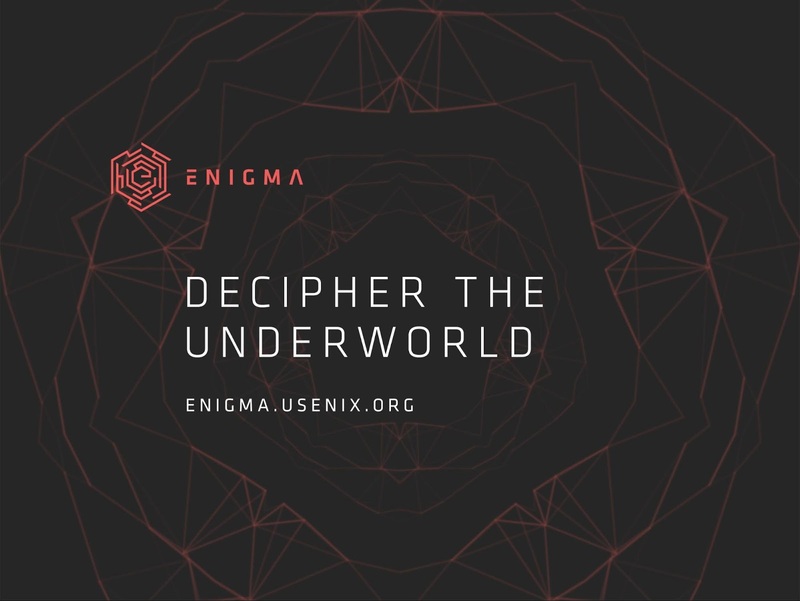 USENIX Enigma is a new conference focused on security, privacy and electronic crime through the lens of emerging threats and novel attacks. The goal of this conference is to help industry, academic, and public-sector practitioners better understand the threat landscape. Enigma will have a single track of 30-minute talks that are curated by a panel of experts, featuring strong technical content with practical applications to current and emerging threats. Google is excited to both sponsor and help USENIX build Enigma, since we share many of its core principles: transparency, openness, and cutting-edge security research. Furthermore, we are proud to provide Enigma with with engineering and design support, as well as volunteer participation in program and steering committees. The 21st ACM conference on Knowledge Discovery and Data Mining (KDD’15), a main venue for academic and industry research in data management, information retrieval, data mining and machine learning, was held last week in Sydney, Australia. In the past several years, Google has been actively participating in KDD, with several Googlers presenting work at the conference in the research and industrial tracks. This year Googlers presented 12 papers at KDD (listed below, with Googlers in blue), all of which are freely available at the ACM Digital Library. One of these papers, Efficient Algorithms for Public-Private Social Networks, co-authored by Googlers Ravi Kumar, Silvio Lattanzi, Vahab Mirrokni, former Googler intern Alessandro Epasto and research visitor Flavio Chierichetti, was awarded Best Research Paper. The inspiration for this paper comes from studying social networks and the importance of addressing privacy issues in analyzing such networks. Privacy issues dictate the way information is shared among the members of the social network. In the simplest case, a user can mark some of her friends as private; this would make the connections (edges) between this user and these friends visible only to the user. In a different instantiation of privacy, a user can be a member of a private group; in this case, all the edges among the group members are to be considered private. Thus, each user in the social network has her own view of the link structure of the network. These privacy issues also influence the way in which the network itself can be viewed and processed by algorithms. For example, one cannot use the list of private friends of user X for suggesting potential friends or public news items to another user on the network, but one can use this list for the purpose of suggesting friends for user X. As a result, enforcing these privacy guarantees translates to solving a different algorithmic problem for each user in the network, and for this reason, developing algorithms that process these social graphs and respect these privacy guarantees can become computationally expensive. In a recent study, Dey et al. crawled a snapshot of 1.4 million New York City Facebook users and reported that 52.6% of them hid their friends list. As more users make a larger portion of their social neighborhoods private, these computational issues become more important. Motivated by the above, this paper introduces the public-private model of graphs, where each user (node) in the public graph has an associated private graph. In this model, the public graph is visible to everyone, and the private graph at each node is visible only to each specific user. Thus, any given user sees their graph as a union of their private graph and the public graph. From algorithmic point of view, the paper explores two powerful computational paradigms for efficiently studying large graphs, namely, sketching and sampling, and focuses on some key problems in social networks such as similarity ranking, and clustering. In the sketching model, the paper shows how to efficiently approximate the neighborhood function, which in turn can be used to approximate various notions of centrality scores for each node - such centrality scores like the PageRank score have important applications in ranking and recommender systems. In the sampling model, the paper focuses on all-pair shortest path distances, node similarities, and correlation clustering, and develop algorithms that computes these notions on a given public-private graph and at the same time. The paper also illustrates the effectiveness of this model and the computational efficiency of the algorithms by performing experiments on real-world social networks. The public-private model is an abstraction that can be used to develop efficient social network algorithms. This work leaves a number of open interesting research directions such as: obtaining efficient algorithms for the densest subgraph/community detection problems, influence maximization, computing other pairwise similarity scores, and most importantly, recommendation systems. When we last updated Course Builder in April, we said that its skill mapping capabilities were just the beginning. Today’s 1.9 release greatly expands the applicability of these skill maps for you and your students. We’ve also significantly revamped the instructor’s user interface, making it easier for you to get the job done while staying out of your way while you create your online courses. First, a quick update on project hosting. Course Builder has joined many other Google open source projects on GitHub (download it here). Later this year, we’ll consolidate all of the Course Builder documentation, but for now, get started at Google Open Online Education. This information can help guide them on which sections of the course to revisit. Or, if a pre-test is given, students can focus on the lessons addressing their skill gaps. 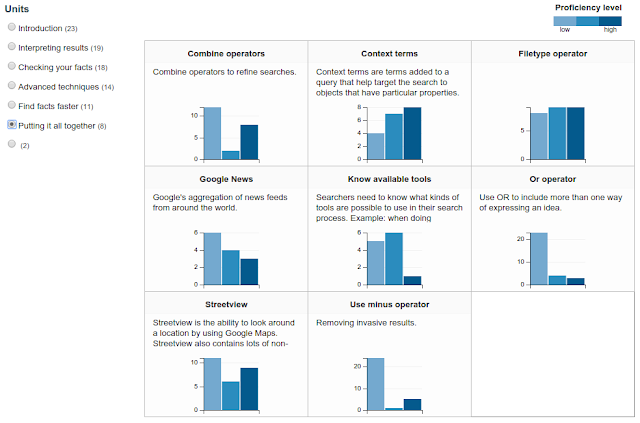 To determine how successful the content is at teaching the desired skills across all students, an instructor can review students’ competencies on a new page in the analytics section of the dashboard. Improving usability when creating a course Course Builder has a rich set of capabilities, giving you control over every aspect of your course -- but that doesn’t mean it has to be hard to use. Our goal is to help you spend less time setting up your course and more time educating your students. We’ve completely reorganized the dashboard, reducing the number of tabs and making the settings you need clearer and easier to find. 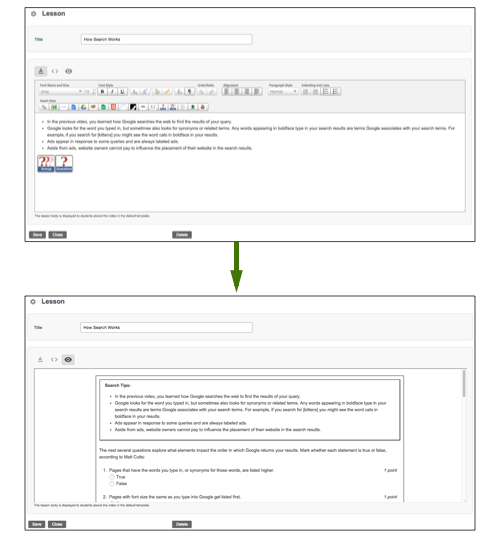 We also added in-place previewing, so you can quickly edit your content and immediately see how it will look without needing to reload any pages. For a full list of the other features added in this release (including the ability for students to delete their data upon unenrollment and removal of the old Files API), see the release notes. 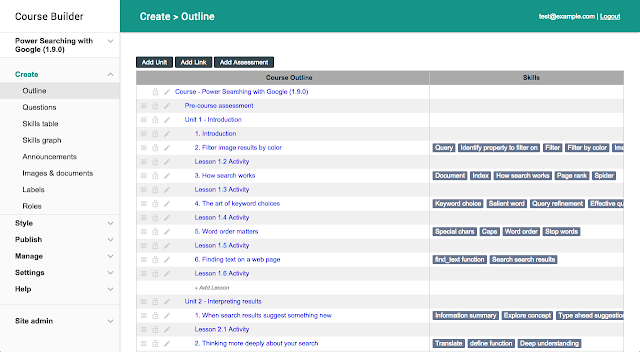 As always, please let us know how you use these new features and what you’d like to see in Course Builder next to help make your online course even better. In the meantime, take a look at a couple recent online courses that we’re pretty excited about: Sesame Street’s Make Believe with Math and our very own Computational Thinking for Educators. Over the past several years, deep learning has shown remarkable success on some of the world’s most difficult computer science challenges, from image classification and captioning to translation to model visualization techniques. Recently we announced improvements to Google Voice transcription using Long Short-term Memory Recurrent Neural Networks (LSTM RNNs)—yet another place neural networks are improving useful services. We thought we’d give a little more detail on how we did this. Since it launched in 2009, Google Voice transcription had used Gaussian Mixture Model (GMM) acoustic models, the state of the art in speech recognition for 30+ years. Sophisticated techniques like adapting the models to the speaker's voice augmented this relatively simple modeling method. 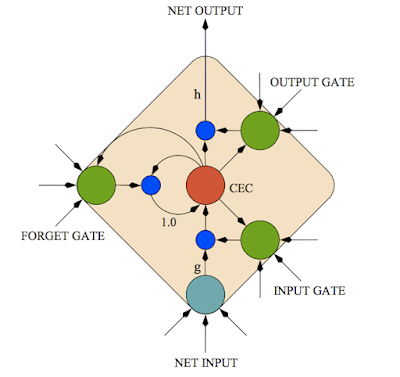 Then around 2012, Deep Neural Networks (DNNs) revolutionized the field of speech recognition. These multi-layer networks distinguish sounds better than GMMs by using “discriminative training,” differentiating phonetic units instead of modeling each one independently. But things really improved rapidly with Recurrent Neural Networks (RNNs), and especially LSTM RNNs, first launched in Android’s speech recognizer in May 2012. 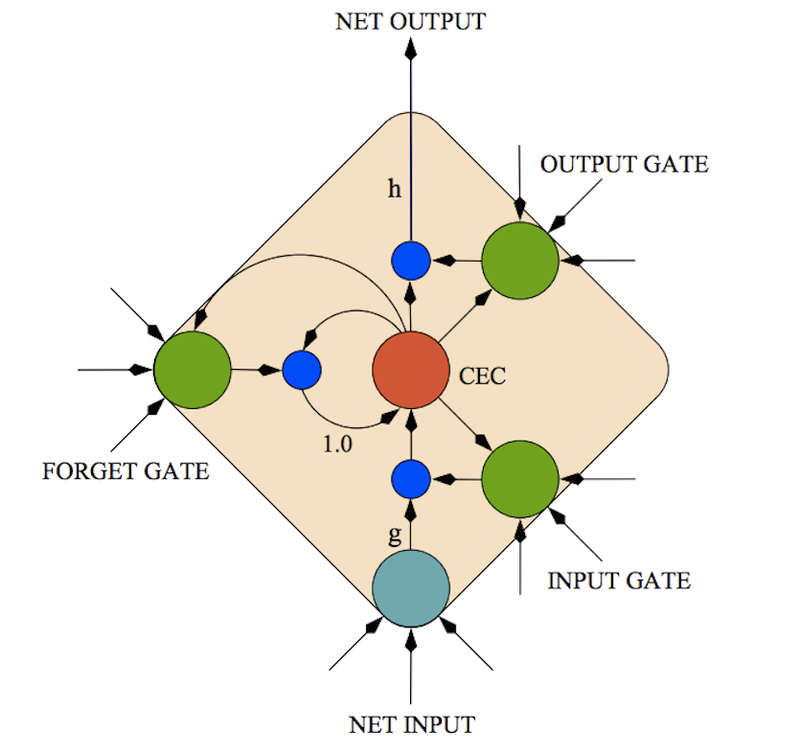 Compared to DNNs, LSTM RNNs have additional recurrent connections and memory cells that allow them to “remember” the data they’ve seen so far—much as you interpret the words you hear based on previous words in a sentence. By then, Google’s old voicemail system, still using GMMs, was far behind the new state of the art. So we decided to rebuild it from scratch, taking advantage of the successes demonstrated by LSTM RNNs. But there were some challenges. There’s more to speech recognition than recognizing individual sounds in the audio: sequences of sounds need to match existing words, and sequences of words should make sense in the language. This is called “language modeling.” Language models are typically trained over very large corpora of text, often orders of magnitude larger than the acoustic data. It’s easy to find lots of text, but not so easy to find sources that match naturally spoken sentences. Shakespeare’s plays in 17th-century English won’t help on voicemails. We decided to retrain both the acoustic and language models, and to do so using existing voicemails. We already had a small set of voicemails users had donated for research purposes and that we could transcribe for training and testing, but we needed much more data to retrain the language models. So we asked our users to donate their voicemails in bulk, with the assurance that the messages wouldn’t be looked at or listened to by anyone—only to be used by computers running machine learning algorithms. But how does one train models from data that’s never been human-validated or hand-transcribed? We couldn’t just use our old transcriptions, because they were already tainted with recognition errors—garbage in, garbage out. Instead, we developed a delicate iterative pipeline to retrain the models. Using improved acoustic models, we could recognize existing voicemails offline to get newer, better transcriptions the language models could be retrained on, and with better language models we could recognize again the same data, and repeat the process. Step by step, the recognition error rate dropped, finally settling at roughly half what it was with the original system! That was an excellent surprise. There were other (not so positive) surprises too. For example, sometimes the recognizer would skip entire audio segments; it felt as if it was falling asleep and waking up a few seconds later. It turned out that the acoustic model would occasionally get into a “bad state” where it would think the user was not speaking anymore and what it heard was just noise, so it stopped outputting words. When we retrained on that same data, we’d think all those spoken sounds should indeed be ignored, reinforcing that the model should do it even more. It took careful tuning to get the recognizer out of that state of mind. It was also tough to get punctuation right. The old system relied on hand-crafted rules or “grammars,” which, by design, can’t easily take textual context into account. For example, in an early test our algorithms transcribed the audio “I got the message you left me” as “I got the message. You left me.” To try and tackle this, we again tapped into neural networks, teaching an LSTM to insert punctuation at the right spots. It’s still not perfect, but we’re continually working on ways to improve our accuracy. In speech recognition as in many other complex services, neural networks are rapidly replacing previous technologies. There’s always room for improvement of course, and we’re already working on new types of networks that show even more promise! Unfortunately, the problem of false discovery is even more delicate than the cartoon suggests. Correcting reported p-values for a fixed number of multiple tests is a fairly well understood topic in statistics. 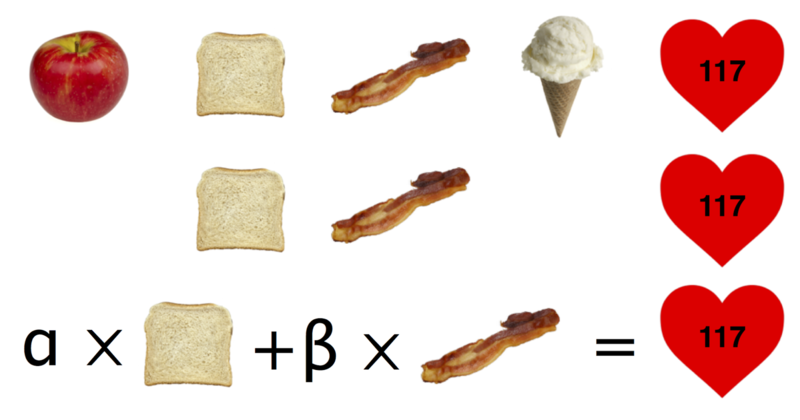 A simple approach is to multiply each p-value by the number of tests, but there are more sophisticated tools. However, almost all existing approaches to ensuring the validity of statistical inferences assume that the analyst performs a fixed procedure chosen before the data are examined. For example, “test all 20 flavors of jelly beans”. In practice, however, the analyst is informed by data exploration, as well as the results of previous analyses. 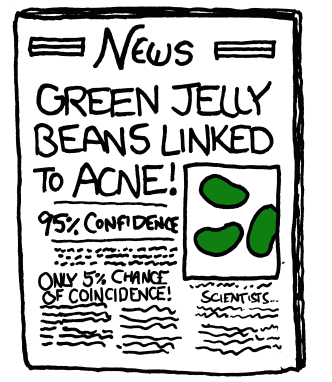 How did the scientist choose to study acne and jelly beans in the first place? Often such choices are influenced by previous interactions with the same data. This adaptive behavior of the analyst leads to an increased risk of spurious discoveries that are neither prevented nor detected by standard approaches. Each adaptive choice the analyst makes multiplies the number of possible analyses that could possibly follow; it is often difficult or impossible to describe and analyze the exact experimental setup ahead of time. A beautiful example of how false discovery arises as a result of adaptivity is Freedman’s paradox. Suppose that we want to build a model that explains “systolic blood pressure” in terms of hundreds of variables quantifying the intake of various kinds of food. In order to reduce the number of variables and simplify our task, we first select some promising looking variables, for example, those that have a positive correlation with the response variable (systolic blood pressure). We then fit a linear regression model on the selected variables. To measure the goodness of our model fit, we crank out a standard F-test from our favorite statistics textbook and report the resulting p-value. Freedman showed that the reported p-value is highly misleading - even if the data were completely random with no correlation whatsoever between the response variable and the data points, we’d likely observe a significant p-value! The bias stems from the fact that we selected a subset of the variables adaptively based on the data, but we never account for this fact. There is a huge number of possible subsets of variables that we selected from. The mere fact that we chose one test over the other by peeking at the data creates a selection bias that invalidates the assumptions underlying the F-test. Freedman’s paradox bears an important lesson. Significance levels of standard procedures do not capture the vast number of analyses one can choose to carry out or to omit. For this reason, adaptivity is one of the primary explanations of why research findings are frequently false as was argued by Gelman and Loken who aptly refer to adaptivity as “garden of the forking paths”. A standard proposal for coping with adaptivity is simply to discourage it. In the empirical sciences, this proposal is known as pre-registration and requires the researcher to specify the exact experimental setup ahead of time. While possible in some simple cases, it is in general too restrictive as it runs counter to today’s complex data analysis workflows. The limit of the method is determined by the size of the holdout set - the number of times that the holdout set may be used grows roughly as the square of the number of collected data points in the holdout, as our theory shows. Sometimes the biggest discoveries are made by the youngest scientists. They’re curious and not afraid to ask, and it’s this spirit of exploration that leads them to try, and then try again. Thousands of these inquisitive young minds from around the world submitted projects for this year’s Google Science Fair, and today we’re thrilled to announce the 20 Global Finalists whose bright ideas could change the world. From purifying water with corn cobs to transporting Ebola antibodies through silk; extracting water from air or quickly transporting vaccines to areas in need, these students have all tried inventive, unconventional things to help solve challenges they see around them. And did we mention that they’re all 18 or younger? We’ll be highlighting each of the impressive 20 finalist projects over the next 20 days in the Spotlight on a Young Scientist series on the Google for Education blog to share more about these inspirational young people and what inspires them. Then on September 21st, these students will join us in Mountain View to present their projects to a panel of notable international scientists and scholars, eligible for a $50,000 scholarship and other incredible prizes from our partners at LEGO Education, National Geographic, Scientific American and Virgin Galactic. 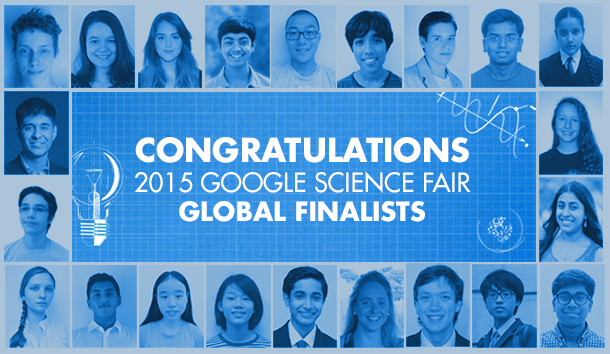 Congratulations to our finalists and everyone who submitted projects for this year’s Science Fair. Thank you for being curious and brave enough to try to change the world through science. 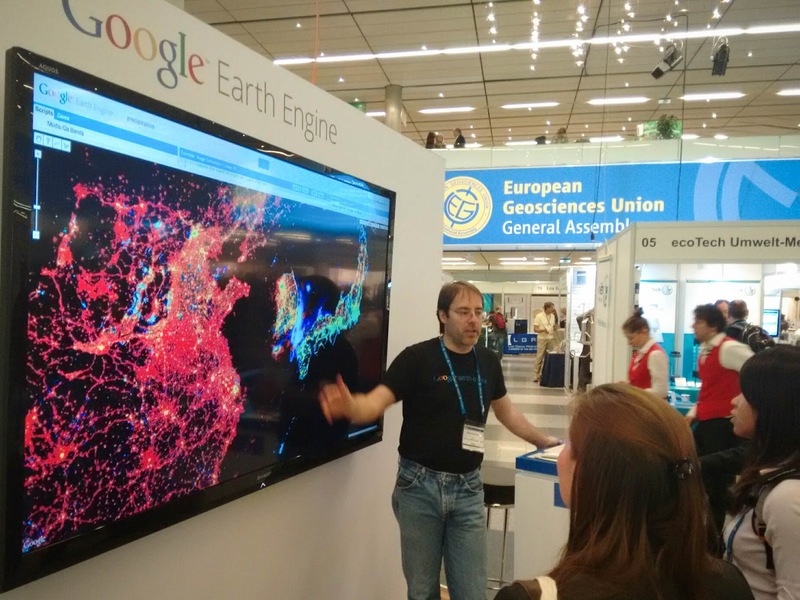 This year the Google Earth Engine team attended the European Geosciences Union General Assembly meeting in Vienna, Austria to engage with a number of European geoscientific partners. This was just the first of a series of European summits the team has attended over the past few months, including, most recently, the IEEE Geoscience and Remote Sensing Society meeting held last week in Milan, Italy. Noel Gorelick presenting Google Earth Engine at EGU 2015. We are very excited to be collaborating with many European scientists from esteemed institutions such as the European Commission Joint Research Centre, Wageningen University, and University of Pavia. These researchers are utilizing the Earth Engine geospatial analysis platform to address issues of global importance in areas such as food security, deforestation detection, urban settlement detection, and freshwater availability. 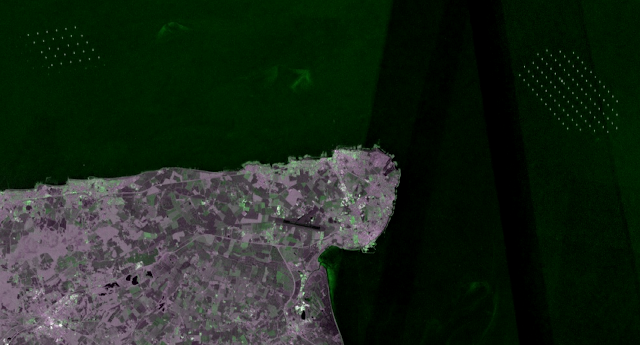 Thanks to the enlightened free and open data policy of the European Commission and European Space Agency, we are pleased to announce the availability of Copernicus Sentinel-1 data through Earth Engine for visualization and analysis. Sentinel-1, a radar imaging satellite with the ability to see through clouds, is the first of at least 6 Copernicus satellites going up in the next 6 years. Sentinel-1 data visualized using Earth Engine, showing Vienna (left) and Milan (right). Wind farms seen off the Eastern coast of England. This radar data offers a powerful complement to other optical and thermal data from satellites like Landsat, that are already available in the Earth Engine public data catalog. If you are a geoscientist interested in accessing and analyzing the newly available EC/ESA Sentinel-1 data, or anything else in our multi-petabyte data catalog, please sign up for Google Earth Engine. We look forward to further engagements with the European research community and are excited to see what the world will do with the data from the European Union's Copernicus program satellites.